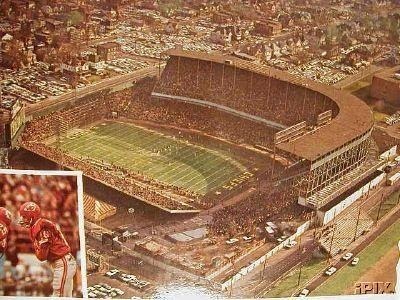 When the Dallas Texans of the AFL moved to Kansas City in 1962, becoming the Kansas City Chiefs, Municipal Stadium was readied for football. Temporary stands were erected in left field to expand the stadium's capacity each fall, but had to be removed during the baseball season. The double-decked grandstand extended all the way across the south sideline (first base line of the baseball field), but ended halfway around the west end zone (third base on the baseball diamond). Both teams' benches were on the north sideline in front of the temporary bleachers, as was the case at other baseball stadiums converted to football use such as Milwaukee County Stadium, Metropolitan Stadium, Tiger Stadium and Wrigley Field. The east end zone ended at the right field fence, and the large scoreboard was in this end of the stadium. Due to the fence, there was significantly less room between the end line and the fence of the east end zone than there was in the west end zone, where there was a significant amount of room between the end line and the grandstand. On September 17, 1964, The Beatles played Municipal Stadium as part of their first U.S. tour. The date was originally supposed to be an off-day for the band, but they agreed to perform when Finley offered their manager, Brian Epstein, a then-record sum of $150,000. The group opened the show with their version of the song "Kansas City/Hey, Hey, Hey, Hey" in this concert.